Wow! A New Year in 10 days time! Time really flies! Our Lord, Savior and Redeemer! A joyful Christmas and a blessed New Year 2010 too. We’d like to take this opportunity to thank all visitors and friends to our garden website, for your continuing support and encouragement through the years. We really appreciate your visits and kind comments very much. And lowly will Thy cradle be. Whom seer and prophet long foretold. I am glad to have known you. 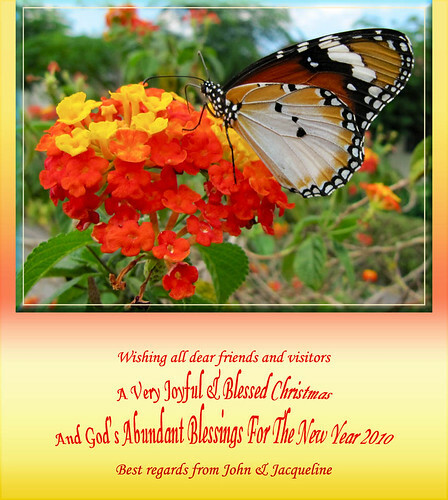 Have a blessed Christmas and Very Happy New Year! I’ve just emerged from my 10day hibernation. Happy New Year and may you be fully blessed from now onwards! Jacqui, i saw your comment that i have not left my name in my comments, am sorry about that, i thought it is automatic. The form asked my name, so i thought it appears there. Actually i already put yours in the blogs i followed since i started visiting your blog. I actually am not very good in these computer languages and sometimes i am not good also in following computer language instructions, hehe. I’ve read about your tutorials and i doubt i can follow them. hahaha! I sometimes visit your blog a few times finding no new posts, imagine i still don’t keep track of the new postings!!! I hope i will still learn. Oh what a nice wish. The picture is so colorful n vibrant. I so like it a lot. Andrea – thanks for your lovely wishes and the same blessings to you too! I think you’re a little confused about what I’ve meant to relate, dear girl. You did sign in with your name, but left the URL request blank. That way, your name remains static, without a link to your blogspot. Happy New Year 2011 to you!